Weber Kettle Temp. 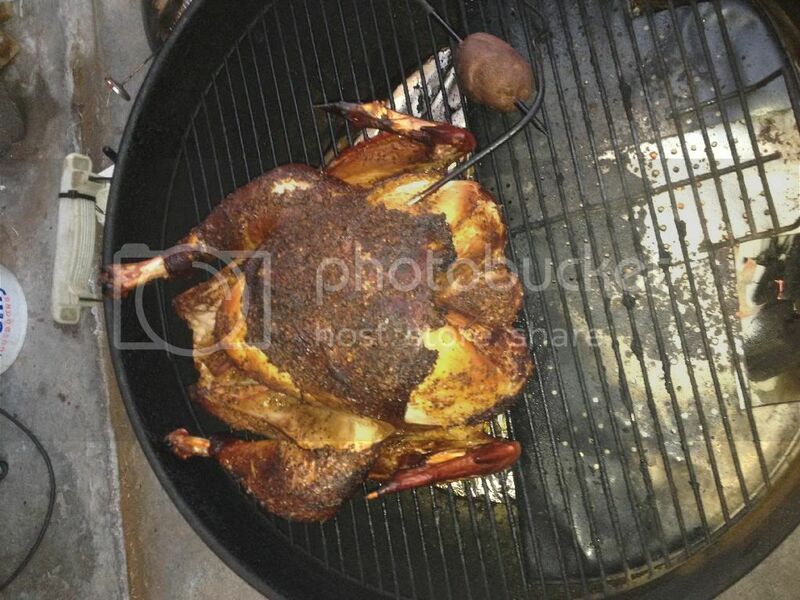 Control - The BBQ BRETHREN FORUMS. What's the best way to control the temperature on longer cooks with the lid on? Is the bottom vent or top vent used more? Thanks for any suggestions. ^^This for sure, but I'd also add that you need to be a little smarter about how the charcoal is setup and how much is initially lit. For longer cooks, usually some sort of snake or banked coals with a minion approach is pretty much required. I've found outside ambient temps and wind also seem to effect the kettle more so than a WSM or certaintly any insulated cooker. I need to light quite a bit more coals initially this time of year to get into the 250ish range than I did over last summer. Name/Nickname : Hey you with the face! Hmmm strange I actually control with the top vent and I leave the bottom wide open. Longer cooks to get better burn times and control temps I like to make row of charcoal 4 row stacked up each side. Then I connect the charcoal at the bottom into a ring then I place equal amounts of lit charcoal to each side on top of the rows stacked neatly this will allow the charcoal to light slowly row by row also I throw wood chips in the row of charcoal where there is space dry wood chips work best but I also add wood chips to my water pan. Keep the lid on during cooking as much as possible. Turn the top vent to half closed typically this will allow you to smoke for a long time. I have done this on my 18" more than my 22" as it consumes less fuel I have done it with 80 briquettes for 15 hours and have not burned all of my charcoal and I never need to refuel except in colder months as it burns faster. For 4-6 hour smokes like ribs I use the minion method just dump a pile of unlit coal in and then put lit coals on top that and same method of vent control it is easier to setup while the other method takes longer. I have found three keys to temp control on my WSM. First I use the minion method for lighting, second I use water in the pan, third I use a bbqguru. With this setup, the bottom vents are closed and top vent is open 1/2 to full, depending on outside temp. A full ring of K blue will take me 12-14 hours no problem. Hope this helps. After a while of practicing, make note of vent position so when you look down at the bottom vent control you will be able to "see" the temp numbers just like on an oven dial. The kettle can be a monster to try to dial in a temperature if you have the One Touch vents. Try not to fight it too much, if it running hotter than you want but not too hot, just let it go. There are different methods that work for different people. The snake method works out good for me. I can dial just about any temperature I want on my kettle between 225° and 350°. I use either the snake method, or minion method. One thing is to block airflow where there is no charcoal, you get much more control that way. Much like SmittyJOnz, or use a cast iron skillet and water, as I do. Also, I run top full open and bottom no more than 1/4" for higher heat, 1/16" for lower heat. I do clean my OTS vents regularly, as ash and carbon buildup can cause more air than is good for a long cook. I start all fires with no more than 10 lit briquettes. In the above image, you can see the lower grate is largely covered by a cast iron plate, there are some large chunks of lump, that I used to retain the actual charcoal burned for this cook. 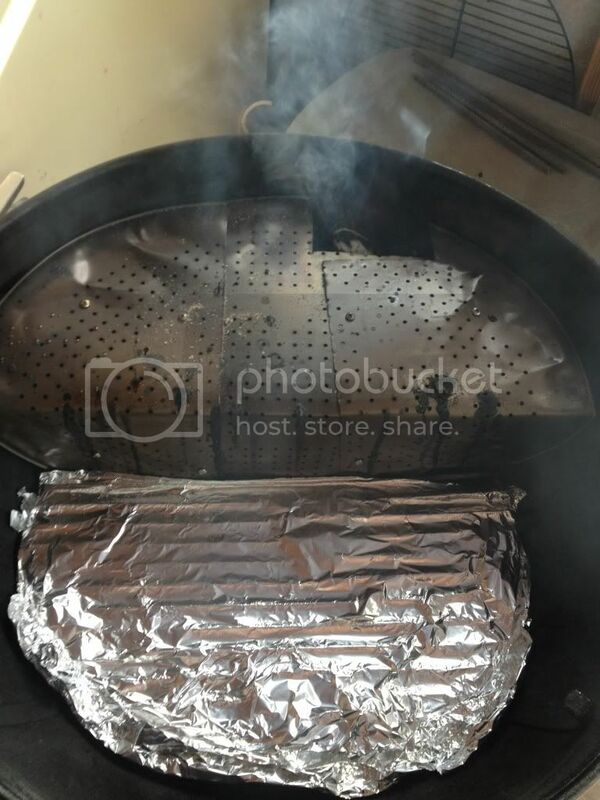 The foil acts as a buffer between direct heat hitting the meat and the fire. 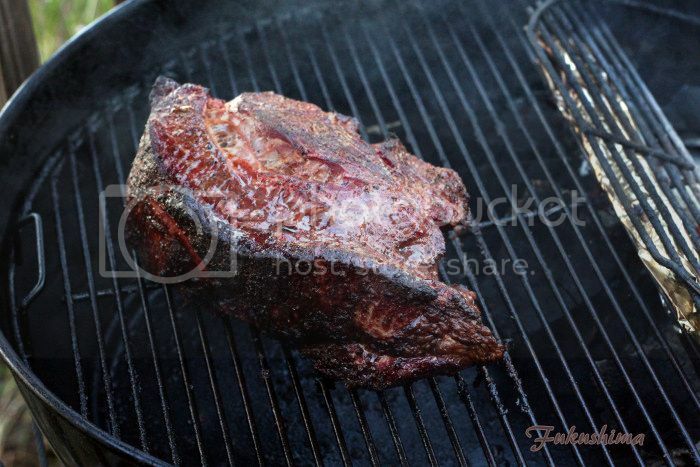 This is a lazy, but, totally effective way to cook for 8 hours at 275°F with just one addition of coals after 6 hours. More good info. Thanks a bunch! I cook on both One Touch and daisy wheel kettles and I find it much easier for me to work with the daisy vents on longer cooks where I can close off one or two vents if needed. Various Weber Kettles 22.5 and 18.5, SJP, Red JJ, Several Smokey Joe's and a mini WSM.